TriJam Podcast! with Kyle Maack, Shae Davis, Jo Rivers, and Will Wright. Produced by Daniel Kane. Our guests today - Mark “Showtime The Shooter” Johnson & Rashira Johnson AND Ant Vibe! Our guests today - Cutty AND Justice Norwood! Our guests today - Teddy Luv AND Ahmin! Our guests today - Tata Sherise AND Aéron! Our guest today - NOT TeamPlay! TriJam Podcast! with Kyle Maack, Shae Davis, Jo Rivers, and Will Wright. Produced by Dan Kane. Our guest today - Stacia Lachole! TriJam Podcast! with Kyle Maack, Shae Davis, Jo Rivers, and Will Wright. Our guest today - DH Worldwide! Our guest today - KY! TriJam Podcast! with Kyle Maack, Shae Davis, Jo Rivers, and GUEST HOST Will Wright. Our guest today - Ragin! TriJam Podcast! with Kyle Maack, Shae Davis, Jo Rivers, and Shaun Lowe. Produced by Taylor Principato & Daniel Kane. Our guest today - Michael Fiya! TriJam Podcast! with Kyle Maack, Shae Davis, Jo Rivers, and Shaun Lowe. 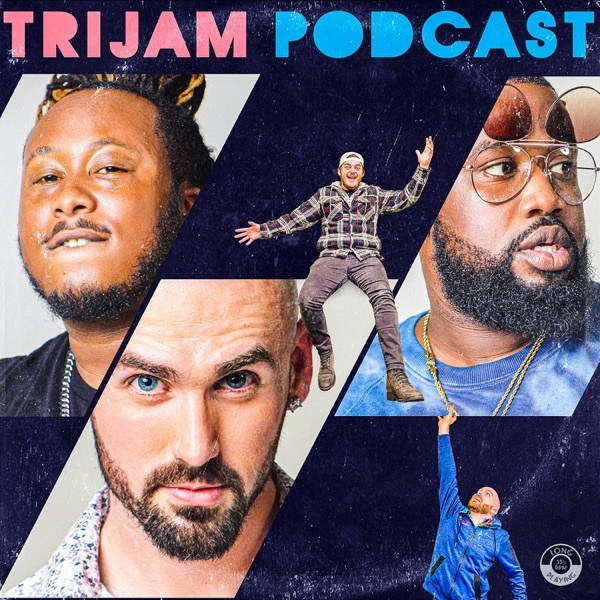 TriJam Podcast - Don Michael Jr.
Our guest today - DON MICHEAL JR! Our guest today - DESMOND DENNIS! TriJam Podcast! with Kyle Maack, Shae Davis, Jo Rivers, and Shaun Lowe. Produced by Tyler “Fuego” Brandow. Our guest today - Smoov2Wayv! TriJam Podcast! with Kyle Maack, Shae Davis, and Shaun Lowe. Produced by Tyler "Fuego" Brandow. Our guest today - Baltimore’s own MYEA! TriJam Podcast - It's Just Us! TriJam Podcast! with Kyle Maack, Shae Davis, Jo Rivers, and Shaun Lowe. Produced by Tyler "Fuego" Brandow. Our guest today - NOBODY! Our guest today - Threat Digga! Also featuring special guest co-host, Darren Eugene, filling in for Shae Davis this week! Our guest today - Our first COMEDIAN, Will Wright! Our guest today - Lawnside NJ native, STEVIE FRANKS! Our guest today - Singer/songwriter and Newark NJ native, TAHJ!